So, I was going through my camera and realized I have a lot of stuff that I haven't shared on the blog. I take pictures of my food quite often, I've realized. I decided to put them together into a "Favorite Things" post with appropriate link-age. This is homemade chicken noodle soup I made from scratch. I'm talking started out with a whole chicken, made stock, etc. That's a big effing deal for me, ya'll. It turned out awesome. Even my 5 yr old picky eater loved it. The recipe I used found HERE. 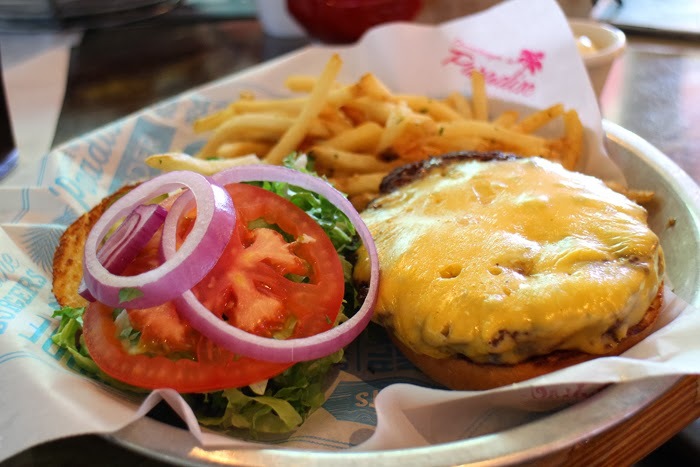 This, my friends, is a big fat burger and fries from Cheeseburger in Paradise. I realize this establishment is a chain, and I've seen them in Atlanta, as well as here in Kansas City. Decided to give it a try. I had no idea the place has this little Caribbean/Tiki Bar kind of theme (duh...Paradise), complete with all kinds of island-y cocktails. I love anything "tiki" inspired, and I plan to hang out at this place regularly, especially when it gets warm. My kind of vibe! 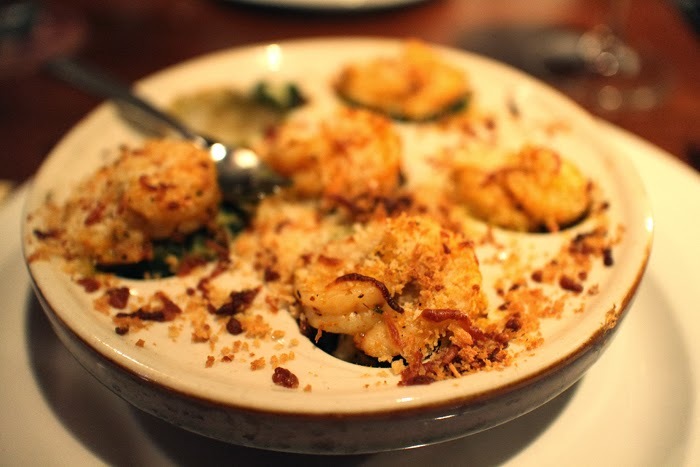 Just so you know, the shrimp and crab stuffed mushrooms at Seasons 52 are divine. We went to the location in The Plaza, by the way. Their menu changes seasonally (get it? ), so they won't be there forever. Try them while you can! I'm a fairly new tea drinker. In the past few years, I've gone from absolutely never drinking any tea, besides the elixir of the south (sweet tea, of course) to being a regular drinker. I first got an interest in drinking tea from reading about all of the health benefits of green tea, in particular, and decided to imbibe. I buy all kinds of brands (Yogi, being a fave) and flavors. Tea hasn't been able to help me kick my coffee habit, so in trying not to consume too much caffeine, I've started drinking some caffeine-free varieties as well. 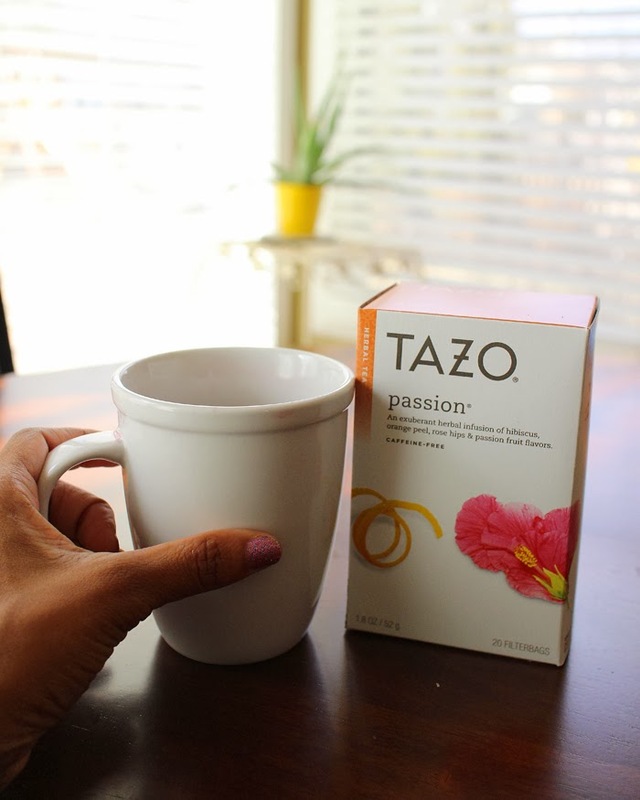 My current favorite caffeine-free tea, hands down, is Tazo's Passion tea. It's so fruity and floral--and ANYTHING with hibiscus in it, I'm drinking it. Hibiscus has such a nice flavor that reminds me of the islands. I brew this in my cup, add a little agave nectar and a squirt of lemon juice. If you're not a tea drinker, I think this is a great "beginner" tea, as the flavor is mild and fruity. So that's all folks! Sharing is caring! ...and I am salivating! Everything look so scrumptious! 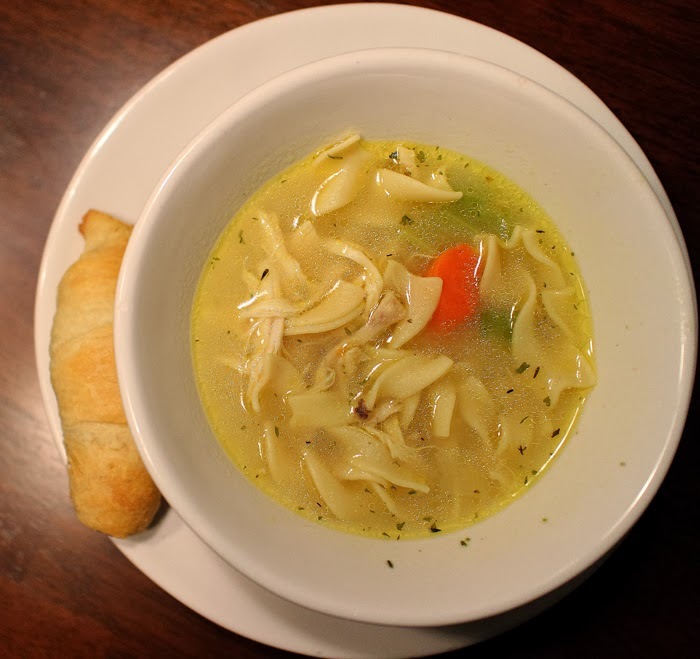 Good job on making chicken noodle soup from scratch. The honey used to love when I did that. Of course, I got to boast about it too. Tehee! I'm the same way. I have a catalog of pictures on my camera that will make excellent blog posts. Yup all I want to do is eat now .. everything looks delicious! That soup sounds great. .. love that you made it from scratch. And I'm with you ... I love taking pictures of food.